Like other skilled tradespeople, plumbers do pretty well for themselves. According to HomeAdvisor, plumbers typically charge between $45 and $200 per hour, depending on their specialty, business type (independent or employed), and geographical market. They can and do charge even more for emergency calls outside regular business hours. The Bureau of Labor Statistics reports that “plumbers, pipefitters, and steamfitters” earn $57,070 per year, on average. That’s not bad for a gig that doesn’t require a four-year college degree. Not surprisingly, labor is the single biggest cost driver for most plumbing repair projects. Bypassing the professional plumber dramatically cuts the cost of basic plumbing projects that don’t require expensive equipment and supplies – often by 50% or more. Why pay a well-compensated pro when you can do the job just as well on your own at a fraction of the cost? Even if your project does call for specialized tools or equipment, don’t assume it’s beyond your capabilities – or that you’ll have to buy the requisite tools new. Renting equipment from a local hardware store costs far less; borrowing it from a handy friend or community tool-lending library may literally cost nothing. Of course, no DIY home improvement project is totally free. Before you begin, determine how you’ll pay for your supplies and equipment: perhaps a low APR credit card with a 0% APR introductory promotion or an unsecured personal loan from a bank, credit union, or online lender. If you have sufficient equity in your home, a home equity line of credit or cash-out refinance loan might work too. With rented or borrowed equipment, your own DIY spirit, and repeated how-to video viewings, you can tackle these home plumbing repair and replacement projects on your own. How to Do It: If this sounds like a straightforward task to you, that’s because it usually is. However, since it’s a prerequisite for many of the projects on this list, it’s essential that you know how to get it done. Basement: In homes with basement foundations, the water line usually enters through a street-side basement wall or floor. The valve should be near the entry point. Crawlspace: In homes built over crawlspaces, the water line usually enters through the street-facing side. If you can’t locate the valve in the crawlspace, it may be in the first above-ground entry point inside the home itself. Slab: In homes built on slabs, the valve is usually in a utility room or attached garage. In warm regions with high water tables, such as Louisiana, the valve may be located in the attic. Exterior: If you can’t locate your valve in the basement, crawlspace, garage, or interior room, check your yard. In warm climates, service lines sometimes break the surface near the street. Your valve should have an obvious flow handle. If the water is on, this handle will be parallel to the pipe. Turn the water off by rotating the handle 90 degrees, so that it’s perpendicular to the pipe. Reverse to turn the water back on. Further Viewing: Check out this detailed overview from Mr. Rooter. How to Do It: Shower heads can be fixed, handheld, or both. None is particularly difficult or time-consuming to install, though attention to detail is important in all three cases. Loosen the old head with an adjustable wrench or slip-joint pliers and discard. Use a solvent solution, such as CLR, to remove rust, calcification, and other debris from the shower arm. Dry the arm, especially around the threads. Apply Teflon tape to the threads and press down to form a close bind. Hand-screw the new shower head into the threads. Finish tightening with pliers or an adjustable wrench. If leaks are present, tighten further or reapply Teflon tape. To install a hybrid shower head with fixed and handheld components, you’ll need to screw in an extra piece – the diverter that controls water flow between the two heads. The process is slightly more time-consuming, and you’ll need to refer to the manufacturer’s installation instructions to ensure that you’re connecting the diverter properly, but it’s not an order of magnitude more complicated. Further Viewing: Check out this quick overview from For Mere Mortals. Close the hot and cold valves under the sink. If the sink has no valves, turn off your home’s main valve. Open the hot and cold taps to drain any remaining water in the lines. Unscrew the water lines manually or with a basin wrench. Disconnect the lift rod (the piece that opens and closes the drain). Remove the nuts at the base of the faucet. Manually unscrew the plastic slip nut on the P-trap (the bend in the drain line) and disconnect the drain flange. Use mineral spirits or rust remover to clean around the drain and sink mounting holes. If not already done, install a gasket at the base of the new faucet. Insert the new faucet into the sink mounting holes. Tighten the mounting nuts. If not already done, install the faucet handles and tighten with a hex wrench (usually provided). Screw in the drain nut and fit tightly with the base gasket (push or screw in). Apply plumber’s putty to the drain flange and screw on over the drain body. Make sure the flange’s pivot hole faces backward. Further tighten the nuts and gasket. Install and test the drain rod assembly. Reconnect the supply lines and run the faucet. Check the entire assembly for leaks and retighten or reinstall as necessary. Your new faucet should come with installation instructions. (How detailed they’ll be is another matter.) Where these instructions conflict with those provided by the manufacturer, refer to the latter. Further Viewing: This video from DoitBest is a crash course in DIY faucet replacement. Caution: Faucets come in all different shapes and sizes. If possible, have your old faucet assembly handy when you shop for your new faucet. Buying the right replacement in the first place will save you time and aggravation. How to Do It: Installing an aerator is super easy. It’s also one of the easiest and most cost-effective ways to reduce your home’s water usage and bring down your water bills. Unscrew your aerator and take it to the store or have it handy while you shop for a replacement online. You’ll need an identically sized and -configured replacement. If the aerator doesn’t unscrew by hand, use an adjustable wrench or socket wrench. Screw in the new aerator, tightening with a wrench or socket wrench. Further Viewing: This Old House outlines the process in two minutes flat. If you’re interested in other DIY fixes that could pay for themselves over time, check out our roundup of home improvement projects that help reduce home ownership costs. How to Do It: This how-to covers only the drain flange (basket) and stopper. It doesn’t address the drain shoe, nor the piping that connects your drain to your main sewer line. Replacing these items may require moving your tub, putting a hole through your bathroom wall, or tearing up your shower tile. I’ve adapted these steps from PlumbingSupply.com’s tutorial on removing and replacing a drain flange. Unscrew your drain stopper and set aside (if not replacing). Insert your drain removal tool (drain key or smart dumbbell) into the drain and rotate counterclockwise until the drain flange pops out. If the removal tools don’t work, use a hair dryer to heat the drain flange and soften the plumber’s putty or silicone holding the flange and base in place. Try again after a few minutes. Clean the drain hole and surrounding areas with mineral spirits. Pat dry, then allow to air dry completely. Check the shoe gasket. If the rubber is obviously worn out or it doesn’t appear to be sealing tightly against the shoe any longer, use a flathead screwdriver to pop it out. Replace the gasket if warranted. Press it firmly against the screw to create a watertight seal. Apply plumber’s putty in a ring on the underside of the new drain flange – enough to form a complete seal with the tub. Place the new flange into the drain hole and screw into the drain shoe’s threads. Hand-tighten for the first few rotations, then use a drain removal tool to tighten (clockwise) until there’s just a little slack left. Use an adjustable wrench for the final quarter-turn. Don’t overtighten – this may squeeze the gasket out of place or crack the tub. Use mineral spirits to remove excess plumber’s putty from around the drain. Insert the existing or replacement stopper, if necessary. Further Viewing: Ottawa Design and Build Renovations goes through the motions quickly but effectively. Caution: Be sure to apply a liberal amount of silicone or plumber’s putty to your replacement flange. Inadequate coverage means leaks, which can wreak havoc on your bathroom floors – not to mention the ceilings and walls below. My dining room walls and ceilings sustained hundreds of dollars in entirely preventable water damage because the previous owner (or a contractor he hired) skimped on plumber’s putty in the upstairs tub. How to Do It: This job is even easier than replacing a drain flange. It’s the first real bathroom repair project I ever tackled, long before I had an ounce of self-confidence in my DIY plumbing skills. I guarantee you can do it too – all you need is a steady hand and some patience. Purchase silicone or acrylic latex caulk. The former is harder to work with, but lasts longer; the latter is easier to work with, but shorter-lived. Use a plastic razor (not a regular razor blade) to cut away the old caulk. Remove lingering chunks with a dry pad or Magic Eraser, then finish the job with a fine rag soaked in mineral oil. Follow the instructions on your caulking tube to prepare for application. You’ll need scissors to cut the tip at a 45-degree angle. Lay down painter’s tape on either side of the joint to be caulked. Use a damp rag to smooth the newly applied caulk in a single fluid motion. Wipe away excess caulk as you go, taking care to leave behind a uniform application. Carefully remove the painter’s tape without disturbing the caulk. Repeat the smoothing process. Wait for the caulk to cure completely before using the tub – ideally, 24 hours. Further Viewing: See Jane Drill goes into exhaustive detail about this relatively simple exercise. How to Do It: If you’re lucky, fixing your running toilet will cost nothing and take just a few minutes of your time. If you’re not so lucky, you could be in for an hours-long process of trial and error punctuated by successive trips to the hardware store. Flapper Problems: Faulty flappers are responsible for many, if not most, running toilets. First, turn off the water to the toilet (locally if possible) and flush. Remove the lid and inspect the valve. If it’s obviously warped or deteriorated, it’s done for; go to the store, buy a new one, and install it according to the manufacturer’s instructions. If it’s not forming a tight seal because the chain attaching it to the flush lever is too short or long, adjust the chain accordingly (using wire cutters to shorten the chain if necessary). If mineral buildup appears to be the culprit, remove the flapper and submerge it in vinegar or mineral spirits for 30 minutes or longer to dissolve the residue. Scrub clean with a toothbrush and replace. Float Problems: The next most likely cause is a faulty float. Floats come in two flavors: ball floats and cup floats. In either case, an out-of-whack float may result in higher-than-normal water levels, which promote running. Check the toilet’s overflow tube – if it’s taking on water, your water level is too high. Use pliers to turn your float’s control screw counterclockwise until the water level stabilizes at least an inch below the overflow tube. Monitor the water levels regularly and adjust accordingly. Fill Valve Problems: This is the most vexing and costly of the three issues. Shut off the toilet’s water, flush, and disconnect the service line (you’ll need pliers or an adjustable wrench). Completely dry the inside of the tank with a sponge or rag. Remove the old fill valve with your adjustable wrench, bring it to the hardware store, and purchase a suitable replacement. Follow the manufacturer’s instructions to install the replacement. Flush to test. Further Viewing: Watch this primer by Home Repair Tutor. How to Do It: Installing a dishwasher is surprisingly simple. There are just two catches that trip would-be DIYers up: the dishwasher’s weight and the prospect of working with electrical wiring. Turn your home’s power off at the breaker. Turn the water off at the sink, if possible. If not, turn the water off at the main line. Take the dishwasher out of the box and inspect against the included schematic sheet. Verify that everything is in the right place and everything the manufacturer says is included in the kit actually is. Uncap your home’s dishwasher drain line and hook up to your new dishwasher’s drain outlet. Crimp the metal clamp (included) around the drain line and thread through the hole to your sink compartment. Position the dishwasher in its housing compartment. Adjust its leg height with an adjustable wrench if necessary. Fasten the dishwasher to the countertop using appropriately sized screws (likely provided in the kit). Attach the dishwasher’s wiring to the local power inlet (like colors together). Screw on the wire nuts and cover with electrical tape. Position the ground wire. Consult the manufacturer’s instructions to ensure you’ve done this properly. Hook the dishwasher’s supply line to the dishwasher 90 (a special fresh water connection that you’ll need to purchase separately) and tighten. Attach the drain line to the sink drain. Turn on the water and power. Test a load and repeat these steps as necessary. Further Viewing: Hometown Handyman has a good primer, but your manufacturer’s instructions should always take precendence. Caution: This project requires some light electrical work. If the thought of manipulating wiring makes you uneasy, even with your home’s power off, save this one for the pros. How to Do It: Slow or stopped drain lines can strike anywhere, but they’re especially common in older homes dogged by years or decades of poor plumbing maintenance. Find the most convenient access point for your home’s main drain line. Ideally, you’ll use an opening below the lowest feeder drain line, such as a basement floor drain. Use an appropriate tool to open the access point. You might need a socket point if the nut is rusted on (a common problem in older homes). Feed a handheld auger or arrow-tipped snake into the drain. Follow the manufacturer’s use instructions to break up any clogs you encounter. With a snake, repeated back-and-forth motion usually does the trick. Flush the drain with warm water to clear any remaining debris and confirm that the drain is moving again. Repeat as necessary. If the clog persists, call a plumbing service that offers free camera inspections to pinpoint the location and composition of hard-to-kill clogs along your main drain line. They’ll give you a hard sell on costly solutions, such as replacing your drain line entirely or applying an impermeable liner. Refuse, politely. Buy a longer auger or snake and start again. Further Viewing: Check out this basic tutorial from FIX IT Home Improvement Channel. Your experience will vary based on your choice of equipment. Caution: Your ability to manually unclog a slow or stopped drain line has limits. For instance, root intrusion is common in homes with mature trees and older drain lines. While it’s possible to temporarily clear root-clogged drain lines, it’s a losing battle – the roots act like drain catches, trapping debris and forming clogs over time. For a solution that lasts months or years, rather than weeks, you’ll need to call in a clog-removal specialist. They use heavy-duty blades and suction equipment to cut and remove roots and associated detritus. Depending on the extent of the problem, you’re looking at a $300 to $600 bill for this work, but it’s better than shelling out $10,000 or more on a new drain line or liner. Your personal safety always takes precedence over your personal budget. Don’t ever put yourself in a hazardous situation simply to save a few bucks on your plumbing repair project – your finances will eventually recover. I studiously avoid mixing plumbing and electrical repair, and I humbly suggest you do the same. There’s simply too much that can go wrong. Your home’s integrity is a close second. If you’re not confident that you can successfully execute a DIY plumbing repair project without making a mess or putting a hole through the floor, stop and call a professional. And if you are confident that you can complete your project with minimal collateral damage? Then it’s time to roll up your sleeves and get to it. Just remember to savor your accomplishment when you’re done – few things are more satisfying than professional results without the professional price tag. 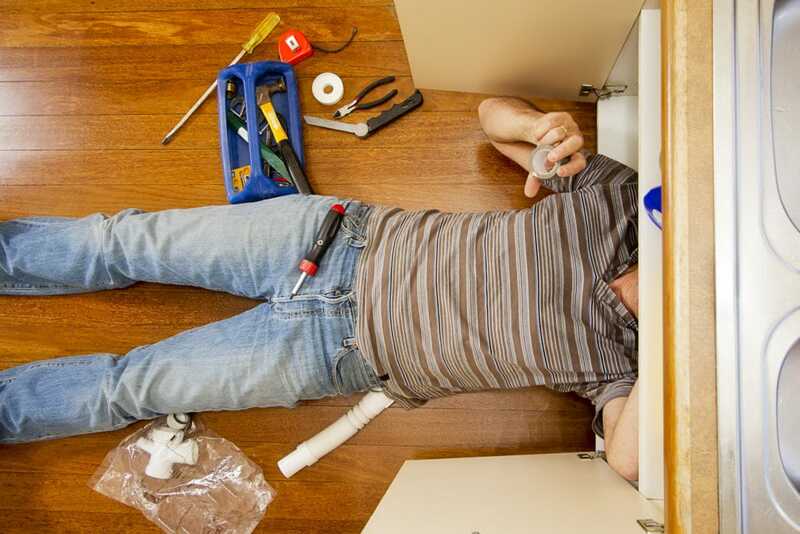 Are you comfortable handling any of these DIY plumbing projects yourself? And are you willing to spend more to get the job done right?